A method and computer-readable medium for generating an activity stream is provided. The activity stream includes a ranked set of objects that are presented to one or more users. The ranking of objects is updated to reflect events associated with objects. As pointed out by Scott Wilson in the comments it looks hard for this patent to stick given the amount of prior art knocking about (especially as I used to use PostRank and still use Google Reader ‘sort by magic’ to make sure the important information stays at the top of my reader). Also the Talis Aspire Reading List Dashboard may address the last case, although it’s unclear if this is prior art. Another example of ranking based on associated event I stumbled on today was in bookmarking site Diigo. 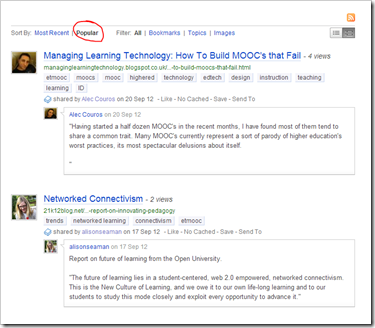 As part of Diigo’s service you can create groups to collaboratively collect and curate resources. As well as a chronological view there is an option to sort by ‘popular’. 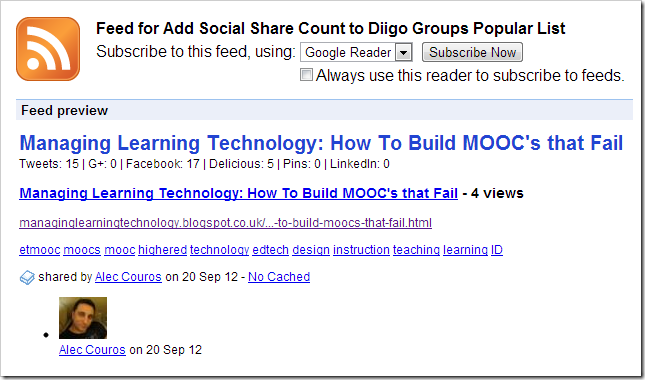 Here’s an example of a Diigo Group for #etmooc. I’m not entirely sure what the ranking is based on but it doesn’t appear to solely be on page views. I’d imagine number bookmarks by other users is another factor or the number of times someone hits the ‘Like’ button. Another example of prior art? I had a quick go with pulling resources from the Diigo ‘popular’ page and using social share counts as another factor in ranking results. I got as far as this pipe which scrapes the top 20 popular items (no api/feed available) and then loops through the results using this sub-pipe, which uses the sharedcount.com API to take a url and see how many times it’s been shared across social networks (here’s a more general pipe that adds social counts to any RSS feed). On one hand because a lot of the bookmarked resource aren’t brand new the counts might be a weak indicator of something (you may want to normalise the weighting based on age of resource), but overall this feels like a rabbit hole (not least because I couldn’t use the social share data to rank the results), so I’m tagging this as a failed idea. 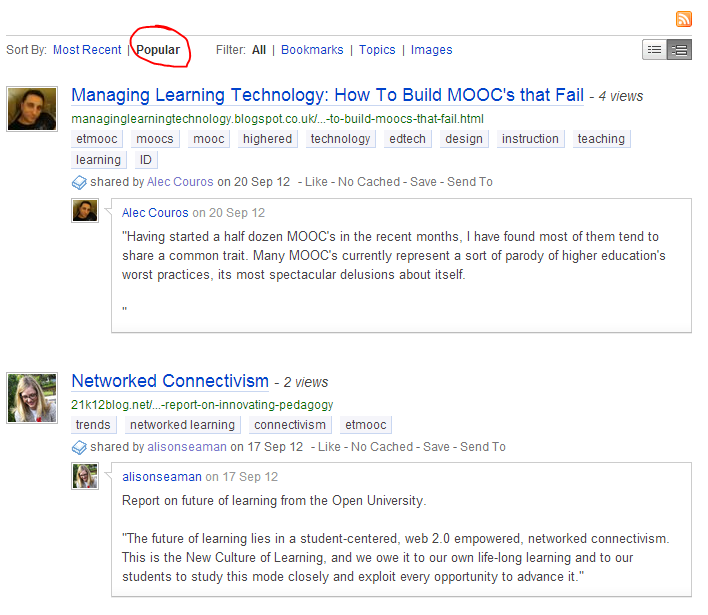 It did get me wondering if within a open course (cMOOC) context pulling bookmarked resources into your course hub using FeedWordPress and then getting participants to rate might be … umm interesting (GD Star Ratings plugin looks good for this although I did spot on the etmooc hub they are using WP PostRatings).